If you HAD to be killed by a horror icon/or sub-icon, who would you choose? I’d pick Mr. Myers below. The Halloween II version. 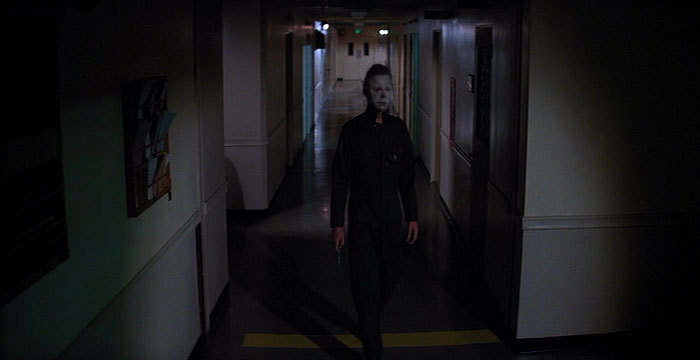 Very scary and he always epitomized the true nature of Michael Myers for me. I’d be the guy who punches him twice in the head with no effect. On the third attempt he’d grab my fist and squeeze. Then I wouldn’t even notice the quick jab to my gut as the scalpel begins taking my life. And I’d drop to the floor and lean against a wall (since one stab wound usually does the job in movies). Seeing him tilt his head at my dying would be a little overwhelming. I’d want to give him the thumbs-up, but I’d already be dead.